Sue Goyette lives in Halifax and has just published her fifth collection of poems, The Brief Reincarnation of a Girl, with Gaspereau Press. Her previous collections include The True Names of Birds, Undone, outskirts (Brick Books) and Ocean (Gaspereau Press) as well as a novel, Lures (HarperCollins, 2002). Sue has been nominated for several awards including the Governor General’s Award for Poetry, the Gerald Lampert, the Thomas Head Raddall Atlantic Fiction Award, the Dartmouth Book Award, the Acorn-Plantos Award and, most recently, the 2014 Griffin Poetry Prize. 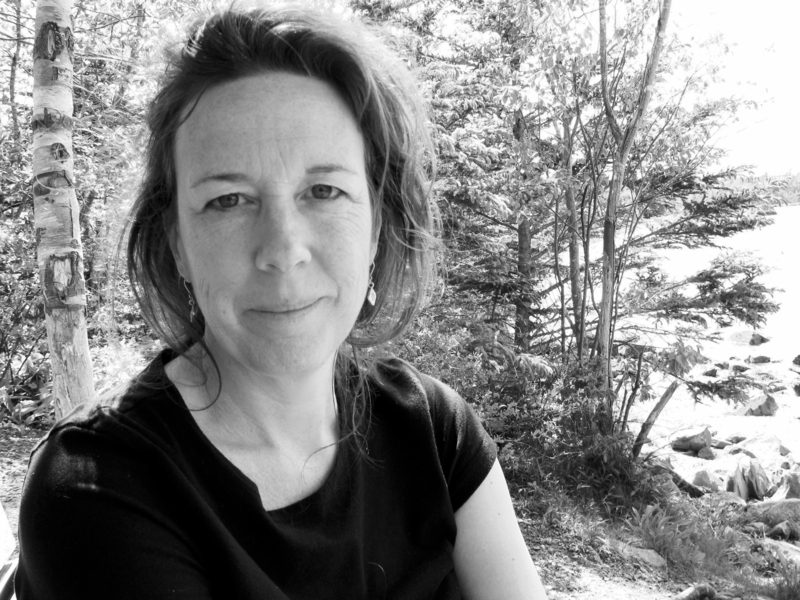 She won the 2008 CBC Literary Prize for Poetry, the 2010 Earle Birney Prize, the 2011 Bliss Carman Award, the 2012 Pat Lowther Award, the 2012 Atlantic Poetry Prize, Silver in the 2013 National Magazine Awards and the 2014 Nova Scotia Booksellers Choice Award. Her poetry has appeared on the Toronto subway system, in wedding vows and spray-painted on a sidewalk somewhere in St. John, New Brunswick. Sue currently teaches in the Creative Writing Program at Dalhousie University. I read Ocean last year and loved its bold ambition, its wit and weight. Sue graciously agreed to an email interview from an unabashed fan. When did you first begin to take yourself seriously as a poet? I’ve always been writing poems. When did my writing practice deepen? Probably when I started writing again in my mid-twenties. I realized then how important my encounters with poetry were. How those encounters informed and orientated my belief and ecosystem. How poetry chimed with something essential in me. How it contributed its own version of vitality to my schedule, and how I had come to rely on it to keep me awake. I was quite young when I had turned to poems, to stories but I trusted their company, their ability to help me feel connected to something bigger and more important than myself. That was key. I don’t feel like it was a choice but more of an opening, like heading in the direction that permitted me to become more me. Can you tell me the story of how The True Names of Birds got published, from either the moment you began writing the first poems, or the moment you decided to put a collection together (whichever came first)? I started writing the poems in The True Names of Birds in a class I was taking in the early nineties. I wasn’t thinking of manuscript but moving from poem to poem, enthralled by the process. I remember feeling starved for learning; every time I read a poet that charged me I felt my world shift geologically. I wrote for about ten years before even considering the idea of a collection or of being more public with my work. How did writing your novel, Lures, impact your poetry? Lures started in poems because that’s what I’d been writing. It’s hard to describe, but I felt a resistance in the form. The poems felt wooden and really prosaic. It was a shock, a volt of freedom when I wrote across the page rather than insinuating line breaks. I was back to learning how to let each poem do what it needed to do. The poems organically fit the shape of a novel, though I continued using the pace of a poem to navigate its writing, that is, in the way the story moved in chapters and in the way I stayed connected to the flow of it. You said in a previous interview that the poems in Ocean “seem so different than the way [you] usually write and are kind of feral to [you] still.” Is that still the case, or did it just mark a new way of writing for you that continues on to the present? I think what was different for me writing Ocean was the pace it required. I wrote it poem by poem but with the feeling of the long haul. Each poem felt like it was an important cog in a much bigger contraption. Normally, there’s space between poems for me: a silence that is active and full of potential. I feel free to roam, to diverge from whatever I wrote last. I didn’t experience those feelings while writing Ocean. Every morning, I returned to the idea of ocean, whatever it meant on that day. It was more about adjusting my stride and breathing. You seem to have a thing for couplets! Ocean is presented exclusively in couplets; some of your earlier work also betrays a proclivity for them. Could you talk about that? Couplets feel organic to me. I like how hospitable they are on the page, how they reckon with the silence of the rest of the page, how aerated they are, how they call and respond to each other and how they, eventually, either break into a single line or become magnet for an additional line. I like how the second line of a couplet could be a shadow as well, could be a sort of wild version of the first. They make for good walking shoes. You’ve balanced a full work life and life as a parent. How has your writing practice continued to change as your children have gotten older? Well, my kids don’t live with me anymore so there’s not the physical interruption of them. When they were young, they were fluid and involved in my writing practice in the way their great energy ensured they would be. Their needs were operatic, their hunger immediate, their stories epic, their jokes raucous. They were great company, truly. In a way, the thinking and level of concentration poetry required suited the rhythm of having kids around. Finding time to write a novel was almost impossible. There was a lot of complaining that I wasn’t really listening to them and they were right. I found it much more challenging to hold on to the entire ecosystem of story in my head. I didn’t have an office until they were teenagers. My daughter would come in after school and lie on the floor to tell me the news of her day. The travesties of grade eight, of grade nine. It made sense to choose that, to work when they didn’t need me. That became easier as they got older. I did always feel bereft of time though, tried cramming my reading in at soccer games, at lunch breaks at work. Now, I know, I am a better person for their company. Blessed, really. I miss them in a way and am also fiercely happy to have their company in the capacity that I have now. They’re two of my favourite people. I invited over a dozen people to read poems as a way to launch outskirts a few years ago and I think that was the first time they read poems by me. It was great, they both chose poems about themselves and added some genius comedic pauses in their readings that were really delightful, editorializing my take on things. I cried— I laughed that hard. What was the great project/challenge of each of your books? Did your formal experiments or subject matter in those books ever cause you anxiety as you wrote? The challenge for me, when I write, is to reach, to risk, beyond my level of comfort, beyond the familiar lay of the land. This instigates a natural anxiety that I’ve had to learn to work with. So there’s that. Then there’s the state of our planet and how to reconcile that state with poetry. How to report on the kinds of global issues we’re experiencing without sounding too dirge-like or dry, too overwhelmed and fearful. There’s great opportunity for imaginative thinking right now and poetry is a formidable invitation to think about things in a new, reinvigorated way. My antenna is reaching into that silence and I follow, not really knowing what I’m doing but feeling like it’s an important thing to do. Is the shift between the concerns of your first book and those explored in your later books evidence of shifting concerns on your part, as a person and poet? I think so. I know the difference between biography and material now and how to navigate that distinction in a way that, perhaps, didn’t occur to me when I began writing. I’m willing to write specifically if it serves the poem but I don’t use the poem solely as a receptacle for my personal concerns in a way that I may have when I was younger. In that way, I’m looking outward more and am deeply interested in how things are progressing. My latest collection The Brief Reincarnation of a Girl came out this spring with Gaspereau Press. I spent some time researching pharmaceuticals and our reliance on them for mental health issues. I was interested in what was being defined as disorders in the Diagnostic Statistical Manual (DSM) and came across a story of a two-year-old girl who’d been diagnosed with an array of mental health disorders. The amount of medication she was on and how many times her dosage was increased bewildered me. She, tragically, died two years later of an overdose. That this was allowed to happen is still unbelievable to me. I rewrote the court trial as a way to reconcile or at least explore the concerns I still strongly feel. What would a younger you be surprised to learn about your present life? That I still persist on the dance floor, that I haven’t learned not to laugh at my own jokes and that I still, occasionally, listen to Led Zeppelin really loud. Ngwatilo Mawiyoo is currently competing an MFA at the University of British Columbia, where she is developing a poetry manuscript based on her travels in and beyond Kenya. Ngwatilo also writes creative non-fiction and work for the screen. She tweets at @ngwatilo.